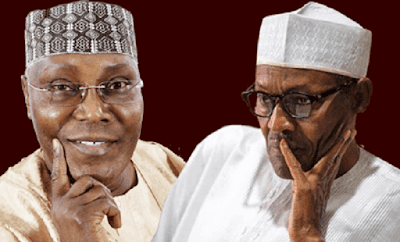 There is some sort of panic in the ruling APC over the results Atiku Abubakar of the PDP said he got and how he allegedly defeated President Buhari. 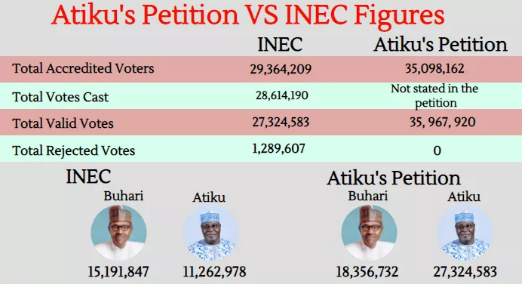 What is more revealing is that up till date INEC has not been able reconcile the results it claimed Buhari used to defeat Atiku. Right now PDP leaders are threatening to stop Buhari’s inauguration until the determination of the petition challenging the President’s victory in the February 23 election. The Presidency has dismissed the threat as “unserious” and dared the PDP to launch its legal battle. The main opposition party was reacting yesterday to the court cases filed against the announcement of results of the March 9 governorship and state Assembly elections in Bauchi and Rivers states by candidates of the President’s party, the All Progressives Congress (APC). Governor Mohammed Abubakar (APC) of Bauchi State has obtained an ex parte order at the Federal High Court stopping INEC from concluding the governorship election. A similar court case was filed by the governorship candidate of the African Action Congress (AAC) in Rivers State, Mr Awara Biokpomabo, seeking an order of the court to stop INEC from releasing the results of the governorship election in the state. But the PDP, which believes that its candidate, Governor Nyesom Wike, won the election, alleged that the case filed by the AAC and its candidate was instigated by the APC. The PDP has filed a petition with the National judicial Council (NJC) against Justice Ekwo Inyang who granted the Bauchi governor the order, inciting a violation of the Constitution and Section 87(10) of the Electoral Act. The said provision of the Electoral Act prescribes that no court has the power or jurisdiction to stop any election pending the determination of a suit. National Chairman of the PDP, Prince Uche Secondus, who decried the action of the petitioners, expressed concerns over hiccups in the conduct of the 2019 general elections. The party, at an emergency National Executive Committee (NEC) meeting in Abuja yesterday, complained about the inability of INEC to conclude the elections in record time. The PDP chieftains were particularly miffed that almost two weeks after, INEC could not conclude the governorship and state assembly elections that were held on March 9. Winners of governorship elections are yet to be declared in seven states where the polls were 'inconclusive'. The states are: Kano, Sokoto, Benue, Plateau, Adamawa and Bauchi states. The concluding part of the elections are billed to hold in the states on Saturday. The governorship election in Rivers state has become a subject of legal rigmarole by interested parties following the suspension of the announcement of the results. Also of grave concern to the main opposition party is what it called the militarisation of the elections in many states in the Southsouth. Secondus who presided over the meeting, called on the military not to allow themselves be called out again for what he described as illegal duties. He enjoined the military and other security agencies to resist any attempt to be dragged into paying manipulative roles in Saturday’s supplementary elections. According to him, “inconclusive” is a rigging strategy introduced by the INEC to aide the APC and its candidates. He expressed optimism that PDP candidates will emerge victorious in the upcoming supplementary elections in five of the six states that the election will take place. Secondus said that posterity will hold the INEC Chairman, Prof Mahmood Yakubu, responsible for the consequences of all his actions. He said: “The way they (APC) are going about getting court injunctions stop elections that have already been held, if we also go to court to stop inauguration of elected officers, it will disrupt the democratic process. “If INEC has to give people the opportunity to go to court, we too can go to court and stop the swearing in ceremony, be it the President or other (APC) governors”.